After winning a $10 gift certificate from The Keri Rodrigues Show, a WSAR favorite, Mom and I decided to visit LePage's Seafood & Grille. Located on the shore of Watuppa Pond near the old railroad tracks, we were very hesitant to get out of the car on this freezing day. However, we were hungry. Fighting against the icy cold wind, Mom and I rushed inside the dining room entrance at around 1:30 p.m. There weren't many cars in their large side parking lot, so we figured that we wouldn't have any trouble finding a table. We quickly spotted a sign that read "please seat yourself." Mom loves when restaurants let the customers choose who they want to sit next to. We picked a table in the back so that I could get a full view of the restaurant. A hostess spotted us walking in and came over with two plastic covered menus and a list of the daily specials. She mentioned that when customers get to seat themselves, they almost always choose to sit in the back. She walked away and Mom and I started checking out the menus. I have been to LePage's twice before, and Mom has been here a few times with Dad. 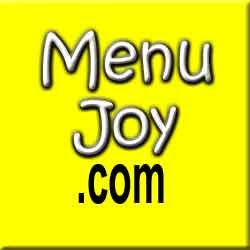 Each time we've visited, the food was very good. Although Mom had to send a hamburger back on one visit because it wasn't cooked to her liking, the rest of that meal was perfect. That's why I was surprised to learn that my friend Gregg is not a fan of this restaurant. I think he said that he only visited once, but perhaps it was on an off night. I've always had a good time here. Looking up from my menu, I spotted a young man walking over to me. He was not in a uniform, and I was a bit confused as to who he was. It turned out to be our waiter. He quickly took our drink order - two Diet Cokes - while Mom and I decided what we wanted. 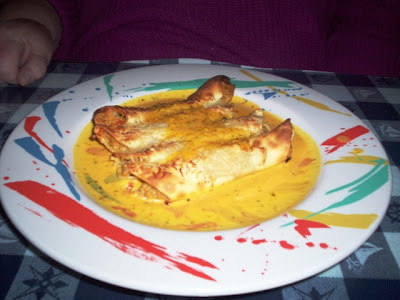 Almost exactly at the same time, we spotted something on the dinner specials' menu that we both wanted to try - the pumpkin manicotti ($8.99). Topped with a sherry sauce, the pumpkin and ricotta filling sounded delicious, and we couldn't wait to have it. I know what you're thinking - why didn't they order seafood? Well, we've had seafood here before and it has always been good, so why not try some of their other dishes? I actually had every intention of ordering my favorite dish - the Portuguese scrod. However, the manicotti changed my mind. I was hoping that I was making a good choice. The waiter came back with our drinks (in plastic glasses), and was now ready to take our order. He politely asked us if we would like more lighting, since we were in the back of the restaurant. We said no, and began to rattle off our lunch wishes. 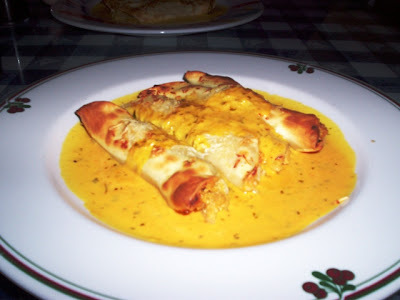 We both ordered the pumpkin manicotti, and the waiter asked if we had tried the dish before. We said no, and he mentioned that he wanted to know how it tasted. We told him that we'd let him know. We also ordered our favorite appetizer - the clam cakes. 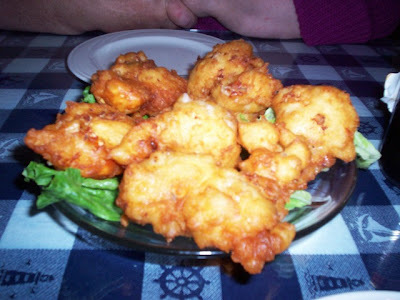 We ordered six ($3.99), and were excited to be having them because they are some of the best clam cakes we've ever had. He took the menus and walked away, and I began taking notes on the beautiful decor at LePage's. 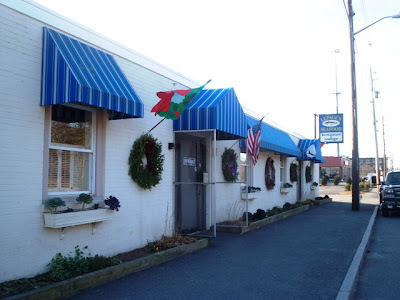 Being a seafood restaurant, LePage's has a lovely nautical theme. With navy blue walls, white ceiling fans, and a huge picture window overlooking Watuppa Pond, you really do feel like your on board a ship. There are no booths here, just tables and chairs covered with blue and white nautical table cloths with a glass top. Atop each table is a small oil lamp, a pleather-bound wine list, and a list of new Starbucks enhanced liquors that Mom had been drooling over. There is an alcove with seating and a yellow colored wall on one side of the restaurant. 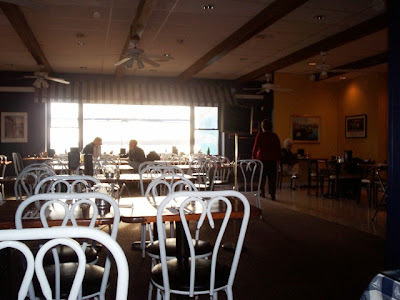 Each window is dressed with a navy blue and white striped awning and gleaming white shutters, and around the restaurant are large paintings of various ships and sea creatures. There is a patio at the back of the restaurant where patrons can dine on warmer days, and a bar area on the other side of the building with televisions and booths for people who want a little something with their beer. A jazz fusion kind of music played in the background, and the staff had trimmed the restaurant with several Christmas decorations. Everything I've ever had here has been delicious. I apologize for the lack of prices, but the take-out menu did not list them. Appetizers range from $3-15 and include favorites like fried clams, oysters, smelts, and calamari, buffalo wings, onion rings, pan sauteed lobster cakes, New England clam chowder, and littlenecks steamed in garlic and oil. Salads include the Caesar, and you can add grilled tuna steak, chicken breast, colossal shrimp, or scallops. Lobster, crab, and tuna dominate the sandwich list, along with others like the chourcio, fish, and 8 oz. black Angus pub burger. All sandwiches are served with your choice of fries or potato salad. Pasta dishes include the salmon penne, which is grilled salmon over penne pasta with asparagus, black olives, sun dried tomatoes, and Gorgonzola cheese in a white wine beurre blanc. Also listed is the littlenecks over pasta, shrimp Mozambique (a Fall River favorite), and the chicken Mozambique over penne. The "landlubber" favorites include the marinated tenderloin tips, surf and turf, and the Captain's cut prime rib dinner (32 oz.). You can also order the Mate's cut (16 oz.). Finally, the main attraction at LePage's is the seafood. With everything from a plate of fried clam strips to the bouillabaisse and baked stuffed shrimp, any seafood lover will have trouble narrowing down their choices. The baked stuffed medley is filled with lobster, sole, shrimp, scallops, white wine, butter, and cracker crumbs, while the blackened Yellowfin tuna is finished with avocado butter and a roasted red pepper jam. My favorite - the Portuguese scrod - is baked in a blend of olive oil, sweet and hot red peppers, tomatoes, onions, and spice. It is served in a silver tray so that it stays very hot, and it absolutely delicious. Dad, on previous visits, has enjoyed the fried seafood platter - a mix of fish, clams, scallops, and shrimp. All the fried seafood dinners are served with fries and cole slaw, and early bird specials are available, along with a 10 percent senior citizens discount on Monday and Tuesday. Owners Carol and Eric LePage give a small biography of the restaurant on the take-out menu, along with a map and directions to the restaurant. LePage's also does catering, and function rooms are available, along with gift certificates that will come in handy over the holiday season. They also accept reservations. After being in business for 19 years, the LePages know what customers want - affordable prices and delicious food. I think that they have certainly got it right. Before we knew it, our clams cakes had arrived. The waiter commented on how good they looked, and he was right. I've never seen a clam cake look more perfect. The waiter asked if we wanted malt vinegar, and I said yes. When he brought back the bottle, Mom and I dug into the clam cakes. We both thought that they were fantastic. They were light, fluffy, and not at all greasy. It was exactly how clam cakes should be cooked - perfectly. They contained several meaty clams which gave them a delicious taste, and there was even an extra cake added to our original six. This appetizer couldn't have been better. The waiter reappeared to ask us how the clam cakes were, and we raved about them. After taking away the plate, I noticed that another table was being given a basket of bread. We've always had bread when we've visited LePage's, and I was surprised that we hadn't yet been given a basket. Before my jealousy over the other people's bread took its toll, our food arrived. Both platters looked and smelled amazing, and Mom put an end to my bread envy and asked the waiter if we could have some rolls. He quickly brought over two small Portuguese rolls with butter. Now the dining could begin! When we first bit into the manicottis, we both said the same thing - "I can't taste the pumpkin." Mom said that the filling tasted more like a stuffing, and thought the main body was the ricotta cheese, which held everything together. She said that it tasted like it was flavored with some pumpkin, and definitely red pepper and onion. It made for a tasty filling, but the pumpkin taste did not predominate. Surprisingly, they seemed to have baked the manicotti until it was crisp. That's different from the usual soft manicotti, but it gave the dish a nice little crunch and didn't distract from the taste. The sauce was delicious. It was a sherry cream sauce and Mom had never had anything like it before. It complimented the manicotti, and as a matter of fact, Mom would say that it kind of dominated the dish. The sherry was the most distinct flavor you could pick out, even more than the vegetables. I felt the same way. I definitely didn't taste the ricotta, but the filling had the ricotta consistency. At times, all I could taste were the veggies and sherry, but that is not a bad thing because it was very good. Adding in the 20% tip before we used our coupon, we left $33 on the table ($10 of it being the certificate). Now it was Mom's turn to use the restroom. While she did I sat in the lobby and grabbed one of their take-home menus. I was tempted to take one of their real menus because it listed the prices, but I controlled myself. I also noticed that they carry a lot of local magazines and newspapers, and there is also a specials' board that lists some of the day's meals. We left the restaurant feeling happy and full, only to get outside and freeze up again in the icy wind. Thankfully our tummies were still warm and satisfied from the delicious meal we had at LePage's. 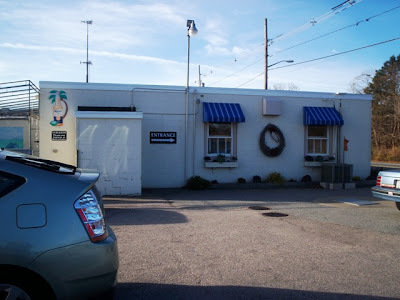 This is definitely a Fall River gem, and we look forward to going back - with or without a gift certificate! LePage's Seafood & Grille is open from 11:30 a.m. to 9 p.m. Sunday through Thursday, and from 11:30 a.m. to 10 p.m. on Friday and Saturday. During the winter season, please call to verify these times.